View history of risky events in app interface. 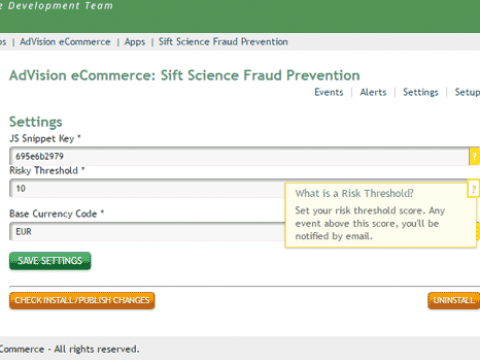 "Manage your risk with Sift Fraud Scores"
Why Sift Science Fraud Prevention app? It can be difficult to determine when a purchase is being made fraudulently online, but Sift's unique fraud management system can help you decide if an order is legit or potentially fraudulent. 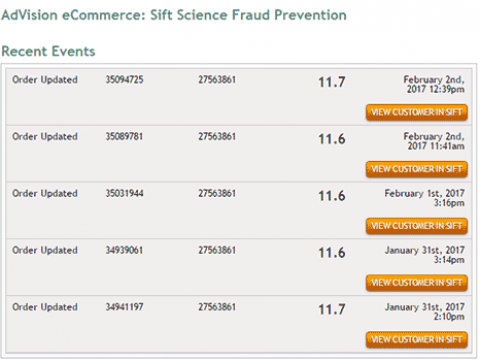 If you're currently having an issue with fraud, or are concerned about potential fraud in the future, the Sift Science Fraud Prevention app uses Sift Science's advanced fraud detection system to rate events (order created, order paid) to determine the fraud risk associated with each event, allowing you to determine how you want to handle the customer/order. 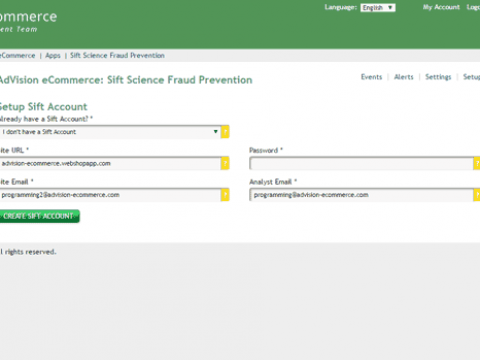 With AdVision's Sift Fraud Prevention app, any time a new order is placed, updated or paid for in your webstore, the order information is forwarded to your Sift account for a fraud analysis. 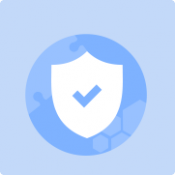 Sift uses it's unique fraud prevention system to analyize your customer's risk level (how likely is this purchase fraudulent) and returns a score to indicate the risk of fulfilling the order. During install, you'll be forwarded to our app management site to either login to an existing account (if you've purchased a Lightspeed eCom app from us before) OR create a new account with us to install and manage this and any future apps you may purchase from us for Lightspeed eCom. AdVision's speciality, is in customizing and supporting, eCommerce web stores, built on a variety of eCommerce platforms and connecting to the 'Retail Industry's' best Point-of-Sale applications. We work for clients all over the world and if at any time you would like to chat with us about your 'hopes, wishes and ambitions' for you online web store or website, please feel free to contact us. Discover AdVision eCommerce. Check out our Age Verification App recently published. Management interface is available in English, Spanish, French, Dutch and German. For basic tutorials and setup information, check out the documentation here.